Now available! Dinner and Dice: a Gaming Cookbook is a collection of recipes and first person game anecdotes from game industry professionals. Originally produced as a stretch goal for the Carolina Game Tables Kickstarter, you will find appetizers, entrees, and desserts from the people who make the games you love! Each author includes a look at how they think about games and food with a first hand game anecdote. Learn what Jason Buhlman served for one memorable Halloween, and what Emily Care Boss prepared for “Matrimonicon.” Hear about the famous ratatouille Marsha White ate and why Steve Kenson’s character sheets are always spotted with cheese. I wrote a poem in iambic pentameter, “The Seven Levels of a Roleplaying Group”, and Ivan Van Norman talks about traffic in L.A. Get a peek inside the minds of the people who make games and a tasty, time-tested recipe to boot! Just in time for the holidays, too. 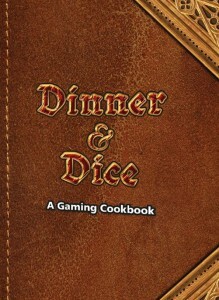 Enjoy Dinner and Dice: a Gaming Cookbook! The Final Empire was built on the backs of the skaa — the downtrodden descendants of those who opposed the Lord Ruler’s ascension a thousand years ago. They are the faceless masses of Scadrial, tasked with plowing the barren fields, sweeping the ash-covered streets, tending the opulent nobility, and serving at the whims of their “betters.” But a few skaa cast off the chains of their destiny to be something more. They are thieves, Allomancers, firebrands, and rebels. They fight the system of oppression and brutality to give their people something they lost long ago — hope. Skaa: Tin & Ash is an essential supplement for the Mistborn Adventure Game, designed for players, Narrators, and fans of the Mistborn novels. Developed in cooperation with Brandon Sanderson, this guide expands the canon of the novels, providing new insights into skaa throughout the Final Empire. Inside you’ll find detailed information on the history and beliefs of the skaa; the lives of city, canal, and plantation skaa; the skaa criminal and political underground; and famous skaa such as the Citizen, Mare, and the Survivor of the Flames. I was one of the contributors to this supplement. 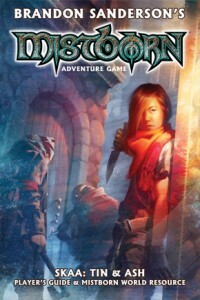 For players of the Mistborn Adventure Game, there’s a bounty of new rules for creating and playing your own skaa Hero, including new Stunts, equipment, Networks, and locations to explore and liberate. Last time in Project #8, I updated you with news about the Firefly RPG, including several awards the line won, and mentioned several balls in the air following a Twitter/FB sabbatical in September. As of today, I’m caught up on everything (e-mails, included), and am heavy on the pitch phase, but I’ve got some updates for you that follow after some words about the intersection between research and reality. This year, I wrote a lot of alternative history and that required loads of research, ranging from the Inquisition to Western colonization and Mussolini-era’s Italy. The key refrain, over and over, that kept coming up was the difference in motivations and values between oppressor and the oppressed, colonists and natives, religious and less devout. This translates, of course, into the way that history is written, but also in the way that it’s perceived. There’s a lot of knowledge that has been obscured for many reasons, in part because the past is not always reexamined to incorporate a different perspective, especially if that alternate view represents a people (or in this case, several peoples) that were hurt, murdered, victimized. Why go this deeply into the past? Roleplaying games, in particular, provide players with the unique opportunity to examine the past in the context of a game. In my experience, gamers are excellent, fantastic readers who will devour anything you put in front of them, and take that a step further by reading more on the subject. By addressing these topics within the confinement of the space provided, I know that other players and designers, such as myself, will dive into the past and learn more about it. And, while a lot of players might not make a correlation between past and present, especially since this research is put through the lens of alternate history, the material and the game can be both challenging and compelling because it makes villains, heroes, and the people caught in between all that more real. In addition to roleplaying games, I find historical research is a fantastic way to dig deeper into worldbuilding. Though problematic tropes can be avoided, I feel that the only way to do that is to read multiple perspectives. For example, you might have seen the heated discussions about the Washington Redskins. The word “redskin”, however, has deep historical, cultural, significance that you can read about here. Reading how the past has led to the present, gives writers a deeper sense of the semantic and literal significance of words, and I feel this is why it’s so important. Writing stories and designing games can be entertaining, sure, but I feel the future of media isn’t to repeat the past for the sake of repeating it, especially since we have faster access to more materials to do deeper research than ever before. Speaking of gaming, I have some fantastic updates for you. As of today, all of my current gaming commitments are complete, but there are more in my future. World of Darkness: Dark Eras – Wrote the Hunter: the Vigil supplement for this book for 1690s Colonial America. My role in this project is now done, and it’s off in the ether of post-editing and development. Vampire the Masquerade: Ghouls – My role on this, too, is now complete, and is in post-editing and development. Conan RPG – I finished my contribution to the corebook, and stepped down as the project manager. Jason Durall has taken my place. Codex Infernus – The Kickstarter was successful, and my role is now done. World of Darkness: Dark Eras II – Contributed to the Geist: the Sin-Eaters supplement for the 1580s-90s Roanoke Colony. The chapter has since been sent off to editing. Of all the things I wrote this past year, this was the most challenging for me. I have been talking about how challenging comics is. So I’m going to continue mentioning what I’m doing to make this a reality. Starry Alpha – Last time, I was working on outlines for an established property. Unfortunately, the line has been canceled so this fell through. Pinefresh Theta – Pitch, full script, and sample sketches sent off to an anthology. I was rejected in favor of a different author, who wrote a similar story. Sparkle Mega – Full pitch is still in the works for a short-term series. The pitch window hasn’t re-opened yet, so this got put on hold. Red Sigma – In addition to pitching, I am going the small press publishing route for a collection. Still in planning stage. Phew! So many updates here… I got through half of NaNoWriMo (e.g. 25K) before I had to stop in favor of zombie projects and proofing that ate up a lot of time. The writing sprints greatly impacted my creativity, and the story got out of control so I had to rein it back in. There’s other stuff not listed here, too, but as 2016 progresses it’ll make more sense. Upside Down: Inverted Tropes in Storytelling – Core of the anthology is done, and we’re working through open submissions. Red Byte – Revisions put on hold. No new movement, here, but I wanted to remind you what I’m working on and what’s coming out. Worldbuilding Book – I’m working with my agent to hone my pitches for interested publishers. Pretty excited about this! For Exposure: The Life and Times of a Small Press Publisher – A book of essays written by Jason Sizemore, the publisher for Apex Book Company as part of the company’s 10 year celebration. I have written a satirical essay which is titled “The Case of the Mysterious Splatter.” It has footnotes. Many, many footnotes. It’s now available. The Gorramn Shiniest Dictionary in the ‘Verse – This language guide for the Firefly TV show will be out this Spring from Titan Books. You can pre-order it now. Awesome! Thus endeth the latest update!